LILLA. Pace caro mio sposo. LUBINO. Pace mio dolce amore. LILLA. Non sarai più geloso? LUBINO. No, non sarò, mio core. LILLA. Son la tua sola? LILLA. Sì, sì, mio bel diletto. LUBINO. Toccami il cor, carina. LILLA. Come ti balza in petto. LUBINO. Son la tua sola? ti vo' morir nel sen. LILLA. Peace, my beloved husband. LUBINO. Peace, my sweet love. LILLA. You won't be jealous anymore? LUBINO. No, never, my love. LILLA. You'll always love me...? LUBINO. With all my heart. LILLA. You'll always be my...? LILLA. Am I your only...? LUBINO. Give me your little hand. LILLA. Yes, yes, my beautiful beloved. LUBINO. Touch my heart, dearest. LILLA. How it throbs in your chest. LUBINO. You'll always love me...? LILLA. With all my heart. LUBINO. You'll always be my...? LUBINO. Am I your only...? Don Giovanni is sung by Rodney Gilfry and Leporello by László Polgár, with the Orchestra of the Opernhaus Zurich conducted by Nikolaus Harnoncourt. Cosa rara held the stage for nearly four decades. But by the mid-1820s it had fallen out of the repertory and was no longer performed. Meanwhile, Mozart's operas (especially Don Giovanni) had been recognized as masterpieces and were becoming ever more firmly established. For most of the 19th and 20th centuries Cosa rara was known only by Mozart's musical quote, and Leporello's comment referring to the Prince must have been mystifying to most operagoers. Martín was considered a minor footnote to the story of Mozart. But as the Savall recording shows, Cosa rara is full of excellent music. In fact Martín does some surprising things. After the overture the music flows directly into the first scene without pausing, driving the drama forward; Mozart would later adopt the same technique in Don Giovanni. 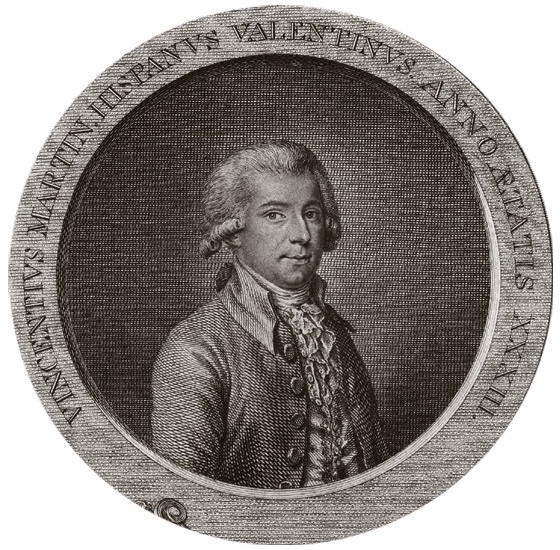 Another surprise is how many ensembles Martín employs throughout the opera (not just in the act finales), a development Mozart would take even further in Cosi fan tutte (That's the way they all are, 1790). The conventional narrative of Don Giovanni's banquet scene was Mozart's genius condescending to Martín's mere talent; Savall's recording complicates that story by revealing that Mozart borrowed significant compositional ideas from Martín. 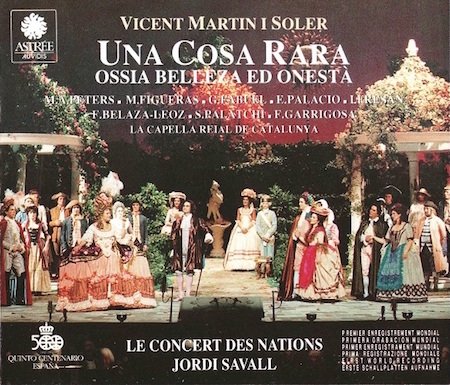 The live Savall recording of Cosa rara with the period-instrument Concert des Nations is highly enjoyable. There is occasionally some stage noise, audience applause marks the end of the acts (and occurs after at least one aria), and as the Queen, Maria Angeles Peters sings consistently flat. But these minor flaws don't detract significantly from the pleasure the performance affords. There is another live recording from 1999 featuring Giancarlo Andretta conducting the modern-instrument Orchestra del Teatro La Fenice (available for streaming for free through Opera Today), but the Queen on that recording is not much of an improvement over Peters, and overall I prefer Savall's singers and well-judged tempi. (Andretta's speeds seem alternately rushed and sluggish by comparison.) Good as Savall's version is, though, it was issued in 1991, more than 25 years ago; it's surprising that no other early-music specialist has recorded this opera since. Perhaps it's time for new recordings and new stagings of the all-too-rare Cosa rara. Update 22 December 2018: Una cosa rara was selected for my Favorites of 2018: Recordings. John Platoff, "Mozart and his Rivals: Opera in Vienna," Current Musicology, Vol. 51, No. 1, 1993, p. 105-111. Lorenzo Da Ponte, Memoirs, quoted in Sheila Hodges, Lorenzo Da Ponte: The Life and Times of Mozart's Librettist, University of Wisconsin Press, 2002, pp. 76-77. 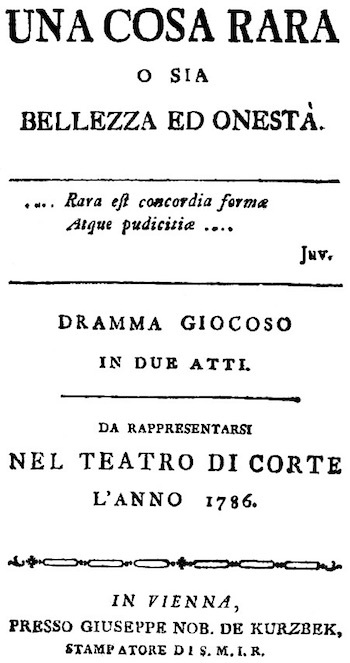 The ban was instituted not "a few days earlier" as Da Ponte has it but on 9 May 1786, in response to the enthusiastic reception of Figaro, already a lengthy opera even without encores. John Platoff, "A New History for Martín's 'Una cosa rara,'" The Journal of Musicology, Vol. 12, No. 1, 1994, pp. 85-115. Curiously, except for the first one Zinzendorf's comments do not correspond to the performance dates of Cosa rara as compiled by Otto Michtner in Das Alte Burgtheater als Opernbühne (Böhlhaus, 1970), pp. 488-489. Zinzendorf's remark of 7 January 1787 comes more than a month after the most recent performance of the opera on 4 December 1786. (It was performed again on 12 January.) The duet must have been "disturbing" indeed for him to remember it so vividly five weeks later. Zinzendorf was not so impressed by Figaro; after the first performance on 1 May 1786 he wrote "The opera bored me" (quoted in Michael Rose, The Birth of an Opera, Norton 2013, p. 100). Da Ponte, quoted in Hodges, p. 77.